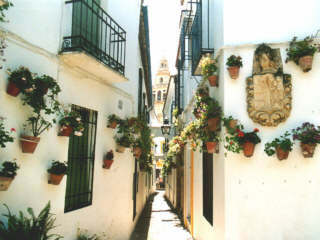 The best known part of the old city of Córdoba is the Judería, the Jewish quarter around the Mezquita. 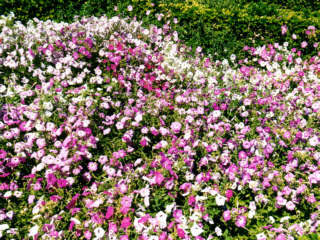 The streets are narrow and filled with flowers, tourists, souvenir-shops and restaurant. After a week on the countryside you need some time to get used to the rush. But only later you find out what misses here: the inhabitants of the city. Only the people working here come in Judería, the others go to their own shopping streets and their own restaurants. 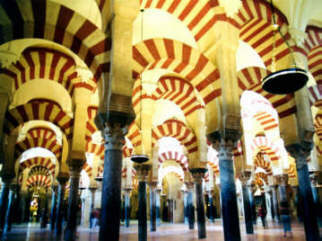 The most famous site of Córdoba is the Mezquita, an enormous mosque, with a cathedral built in the middle of it. 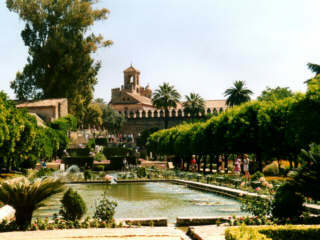 Córdoba used to be the capital of the Moorish state. In 711 the Moors started to conquer Spain, in 1492 (!) the last ones were driven away. 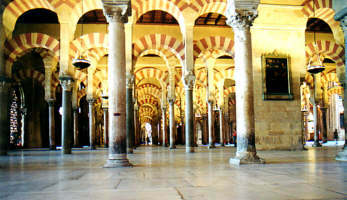 Over 850 columns and arches form the Mezquita. The effect is an impression of endlessness: everywhere and in every direction the same view. This is exactly the objective: it visualizes the unending presence and overall being of Allah. 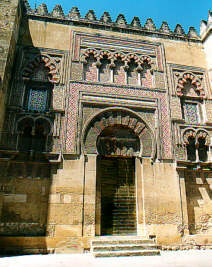 After the Reconquista the Christians demolished a part of the mosque and built a cathedral inside it. Although it really fits in, it still injures the purpose of the mosque. But we admit: if the Christians hadn't built the cathedral in the mosque, the complete mosque would probably have been destroyed. 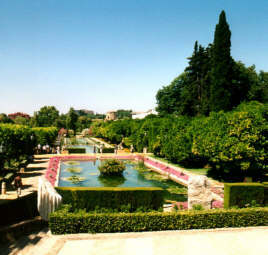 Just a little less known is the Alcazar of Córdoba. Not as big as the Alhambra of Granada, but very nice. 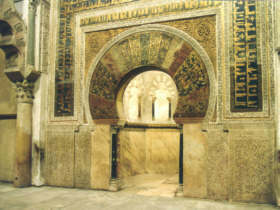 In the palace itself are several mosaics. 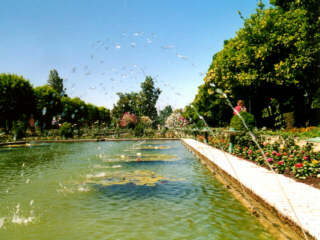 The gardens have a lot of ponds and fountains, giving a cool impression on a hot summer day. The painter Julio Romero de Torres has made some nice paintings. 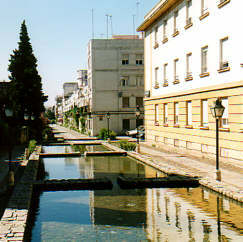 Posters of the best works can be seen everywhere in Córdoba. 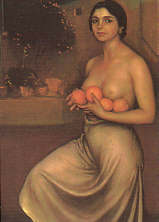 We liked this painting the best, Naranjas y limones (oranges and lemons), on which the girl is holding only oranges. When we had seen everything that we wanted to see (and was open on a Sunday) in Córdoba we stopped for tea in a 'real' Arabian teahouse. In this teahouse we could taste the atmosphere of the times when the Moors were still here. The only thing missing was a couple of Arabians lurking on a waterpipe. An hour later, we got back to our car. The car's thermometer indicated 43oC. No wonder we thought it was a little hot. As we drove back to our hotel in the cool hills of the Sierra Norte, the temperature dropped slowly to only 34oC. Better.